RSCCF receives funding from Fife Council and the Scottish Government to cover part of its running costs. However, the organisation is not part of the National Health Service or the Social Work Department, and therefore RSCCF relies on its clients to make a realistic contribution towards the long term sustainability of the organisation. There is a £20 fee (£10 for unemployed) for the intake appointment, payable at time of booking the appointment, the counselling is by donation. It costs this organisation £50 to provide a session for clients. To enable us to help as many people as we can with limited resources, please read the guidelines below carefully. Initially you’ll be offered a block of 6 counselling sessions, after which a review will take place. 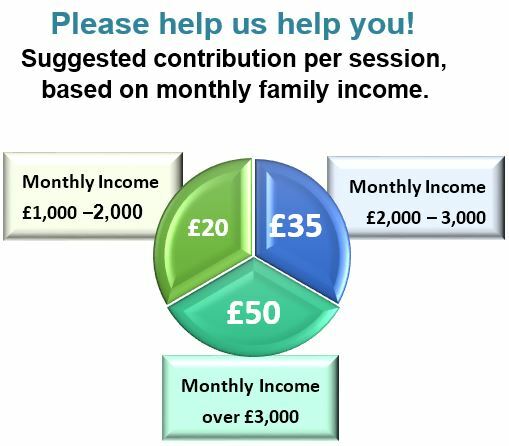 If your combined monthly income is less than £1000, please discuss a concessionary rate with your counsellor.